The annual juried student exhibition celebrates the creative work of students from any discipline and is open to undergraduate­ate, graduate and post-baccalaureate students­dents. The exhibition is selected by a juror from outside Wyoming. This year’s juror was Robyn Peterson, executive director of the Yellowstone Art Museum in Billings, Mont. 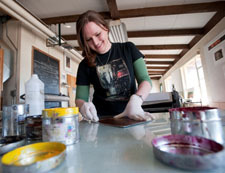 Left: Alethea Durney, Basin, Wyo., working in the printmaking studio, received Office of Academic Affairs Purchase Award in the Student Juried Art Show. Center: Dan Toro, Laramie, painting in the art studio, received the President's Office Purchase Award and the Ann Simpson and Family Award in the Juried Student Art Show. 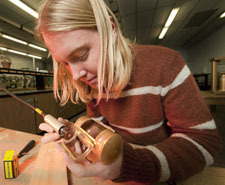 Right: Nash Quinn, Sheridan, Wyo., working in the metal smithing lab.